laying sideways in the gutter. 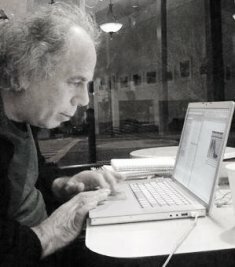 Dennis J. Bernstein is a long-time, front line reporter specializing in human rights. His articles have appeared widely in such publications as the Boston Globe, the New York Times, The Progressive, and the Nation, and he was chosen by Pulse Media as one of "20 Top Global Media Figures of 2009." Dennis's artist books, co-authored with Warren Lehrer, are in the Special Books Collections of the Museum of Modern art in New York City and other major museums around the world. He is also the author of a poetry collection, Special Ed, based on his experiences as a special education teacher in the New York City public school system; read reviews here. Dennis lives in San Francisco. Ha ha! The bees will be along soon, too, I suspect, with the yellow crime scene tape. Thanks for a fun poem! These small observations, small scenes, become huge in a good poem like this one. Good work, Dennis.